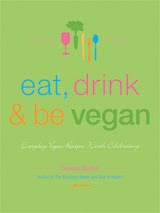 eat, drink & be vegan: ed&bv visits the White House! (and, sprouter winner)! ed&bv visits the White House! (and, sprouter winner)! Okay, I mentioned this on fb yesterday, but since it might be the coolest thing that has happened in my cookbook career, I must blog about it for those of you that don't know. You have to learn how to prepare healthy and nutritious foods, meals that are chock-full of protein and vitamins (think legumes, soy, nuts, lentils, tempeh, etc.). Check out useful and delicious cookbooks such as Veganomicon: The Ultimate Vegan Cookbook by Isa Chandra Moskowitz or Eat, Drink & Be Vegan by Dreena Burton. !!!! !, !!! !, and a little more !!!!! Link through to read more of the article. Isa actually sent me the link on fb, which I totally appreciated (thank you miss Isa! ), because I wasn't otherwise aware of the article. Okay, I'll move on now. On to the winner of the sprouter... congratulations Radioactive Vegan! Please e-mail me (dreenaburton@gmail.com) so we can coordinate the shipping. WOW Dreena! That's amazing! Congratulations! I use google alerts to let me know when any of our books are mentioned online. It's pretty neat to see where they pop up and how often! Wow! That's awesome! What an honor! axtextpress, funny, I do get the google alerts, but didn't get any about this article. thanks for the note about them all the same! wow! totally cool. that is nice publicity! That is so great. Good for you. First stop The White House, second stop Ellen. Congratulations, Dreena! This is fabulous!!! Awesome! Also very cool that veganism is becoming more mainstream. Congratulations Dreena! That's terrific news. Congratulations! Your cookbooks are definitely well used in my kitchen.